I had some leftover coconut and wanted to use it up. I had a hankering for muffins and though, 'why not', and set to making them. Now, I will share with you all since I have had so many requests. Melt the stick of butter, allowing it to cool afterwards but do not let it coagulate again. Combine the flour, baking powder and salt in a large mixing bowl. In a separate bowl, beat the egg. Add in the sugar, milk and vanilla. Mix well. Add the melted butter slowly to the egg mixture. You do not want it too warm or it will cook the egg. You also only want to add a little at a time, mix, add some more, mix and keep going until its all in. Now add it to the dry ingredients you set aside and mix. Do not over-mix. Lumpy is good! Add 1/4 cup of coconut and mix. Add the mixture to muffin pan. Fill almost to the top of the liner. Set aside when all are topped up. Now, in a small sauce pan, add the other 1/4 cup of coconut. Turn the heat to med-high and keep stirring the coconut over the heat until it is lightly golden. When it is golden, remove from heat. Using a small spoon, add some 'toasted' coconut across the top of the muffins. It gives it a streusel-like topping. Now pop those bad boys in the oven and bake until the toothpick comes clean, or approximately 20-25 minutes, depending on your oven. that looks so yummy! Now you know what to make for me when we have coffee! 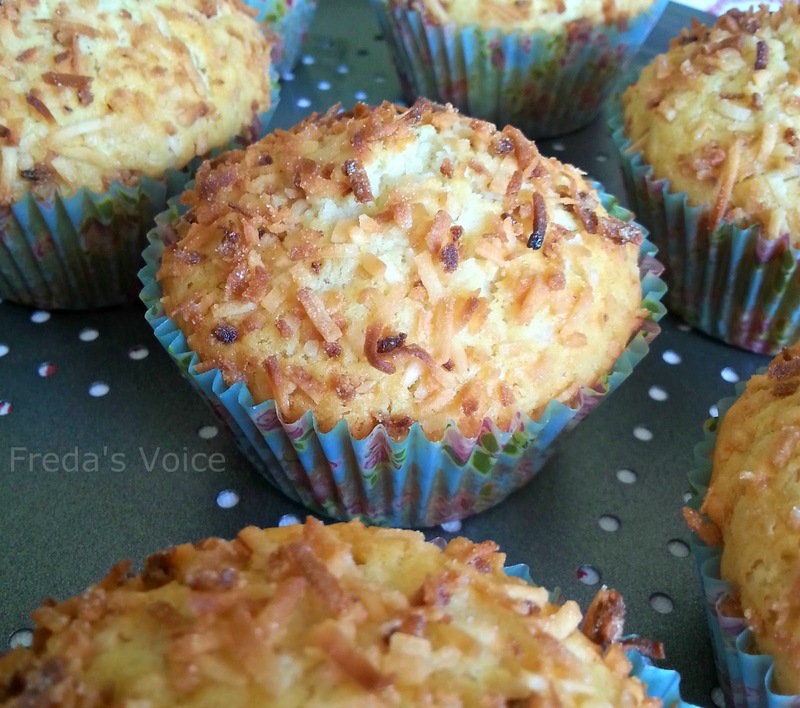 I love coconut so these look absolutely perfect and easy to make! These look wonderful. I've never made coconut muffins before. Thanks for the recipe. My mother in law loves coconut, will have to try these and take a few to her!